is a sparsely populated region of the Central Coast of California where the Santa Lucia Mountains rise abruptly from the Pacific Ocean. The name "Big Sur" is derived from the original Spanish-language "el sur grande", meaning "the big south", or from "el país grande del sur", "the big country of the south". The terrain offers stunning views, making Big Sur a popular tourist destination. Big Sur's Cone Peak is the highest coastal mountain in the contiguous 48 states, ascending nearly a mile (5,155 feet/1571 m) above sea level, only three miles (4.8 km) from the ocean. Although Big Sur has no specific boundaries, many definitions of the area include the 90 miles (140 km) of coastline from the Carmel River south to the San Carpoforo Creek, and extend about 20 miles (32 km) inland to the eastern foothills of the Santa Lucias. Other sources limit the eastern border to the coastal flanks of these mountains, only three to 12 miles (19 km) inland. 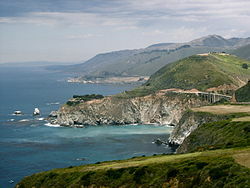 Another practical definition of the region is the segment of California State Route 1 between San Simeon and Carmel. The northern end of Big Sur is about 120 miles (190 km) south of San Francisco, and the southern end is approximately 245 miles (394 km) northwest of Los Angeles. The many climates of Big Sur result in an astonishing biodiversity, including many rare and endangered species .